Scotland, counting 5.3 million inhabitants, is one of the favoured vacation destinations of many Germans. Thanks to frequent visits, investigations on Scottish land, and being in touch with Scottish colleagues, several of our private detectives and corporate detectives are very familiar with the country, its history, the language, the geography, and local customs. For this reason, we offer the services of our detective agency also in Scotland, cooperating with local partners – we will gladly advise you on your specific case and the conditions for hiring the Detective Agency Kurtz: +49 201 3840 9057. Edinburgh, the Athens Of The North, is the cultural centre of the northernmost country of Great Britain and besides Glasgow (see below), it is also the main location for businesses. The Scottish capital is home to about half a million inhabitants, as well as the parliament which is traditionally dominated by the supporters of the independence from the English crown. The Scots are a proud people which have contributed highly important people like the philosopher David Hume and the author Walter Scott. 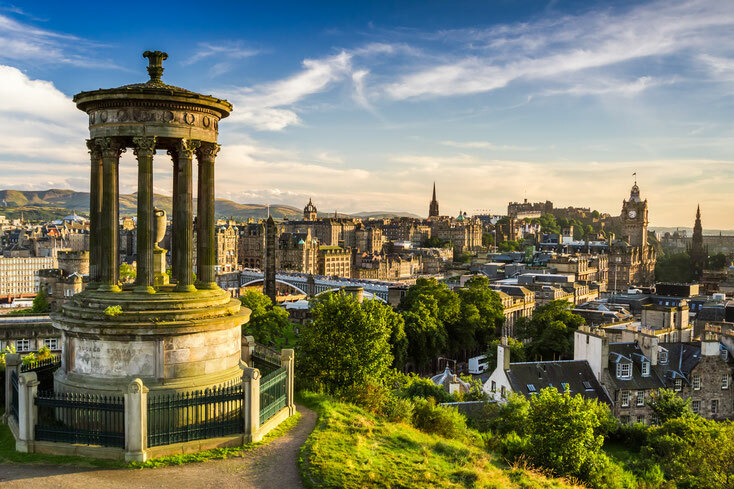 At every corner in Edinburgh one can experience the moving history of the city and of the country, the tourists shape the cityscape in the months of summer and not every inhabitant is happy about the sheer masses of visitors. In this way, also detectives from abroad stand out when investigating internal issues. That is why our detective agency only employs German private investigators in Edinburgh for monitoring travellers – even if the detectives in our team who are frequently employed in Edinburgh know the city very well (our head detective, Patrick Kurtz even made the Scottish capital city the setting of his novel "Livingstones Mahnung"). When an investigation at the local authorities or a surveillance of locals is required, the Detective Agency Kurtz employs Scottish investigators with whom we have been collaborating for years. View from Calton Hill onto Edinburgh's old town, the Castle and the Scott Monument which is the largest monument worldwide dedicated to an author. The biggest city in Scotland and the third biggest city in the United Kingdom is a place of contradictions. Concrete blocks and historical buildings stand next to each other, the Highway goes directly through the city centre while only a few metres further the recreational area Kelvingrove Park is one of the best of its kind in Scotland, and the inhabitants are a mix of workers, business people and intellectuals. The mood of the city constantly shifts between party mood and tristesse. Glasgow is a very special place and the changing moods of the inhabitants are not exactly everybody's cup of tea. Our detectives in Glasgow are familiar with the city and the people, and they will gladly take care of your case. 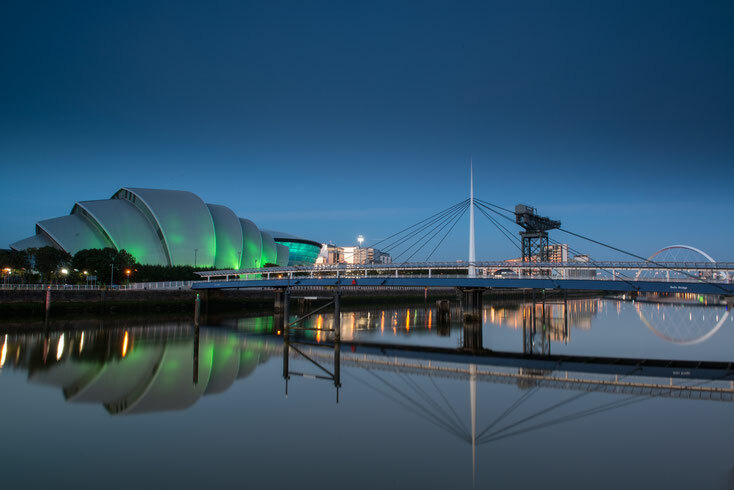 The Clyde Auditorium which reminds of the Sydney Opera House and which is nicknamed "The Armadillo" is located at the shore of the eponymous River Clyde and demonstrates the variety of the city's architecture. The sparsely inhabited Highlands. Numerous legends are associated with this place, for example, Shakespeare's "Scottish Play" Macbeth is based on a local story. A spectacular new interpretation with the German-Irish actor Michael Fassbender in the leading role was presented in Cannes in 2015. The shootings on the Isle of Skye were accompanied by the legendary misfortune which all Macbeth productions and performances have to face: "Strange things happened," stated Fassbender. The Highlands are a lonely place, many people here live on isolated properties, far away from larger towns and main roads. The conditions for any surveillance work are accordingly sensitive in many places as every outsider stands out immediately and the accepted disguise as a "tourist" only works for a limited time. It is, thus, even more important here than in the big cities of Edinburgh and Glasgow to employ local investigators. Since our head detective Patrick Kurtz spends at least a few weeks in the Highlands every year, he not only knows the region inside out, he also cultivates contacts with a number of qualified private detectives in the Highlands, and we will gladly offer you their expertise: kontakt@detektei-kurtz.de. A view like in Harry Potter? Exactly! 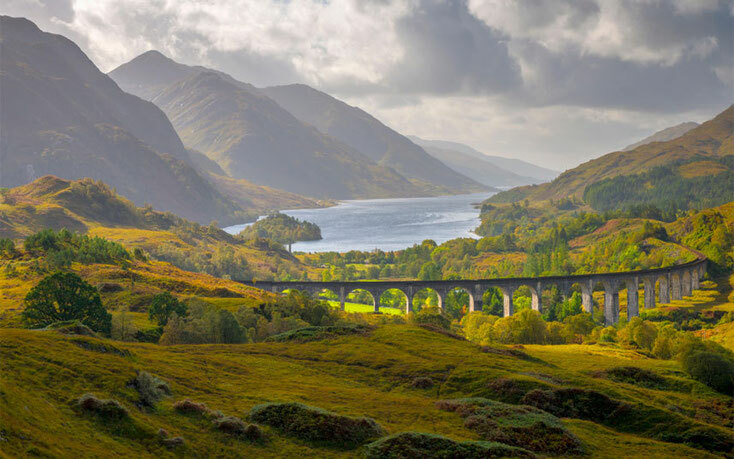 The Glenfinnan Viaduct in the Highlands was used as the Harry Potter film location for the Hogwarts Express, and the mountains and Lock Shiel behind it were used for exterior shots of Hogwarts and its grounds. The German city Essen and its cunning advertising and marketing department have found specific inspiration in one particular event of Scottish culture: The Highland Games. Based on this worldwide known sports event that is held during the Scottish summer, the grounds of the UNESCO World Heritage Site of the Zeche Zollverein hosted the Ruhr Games in the beginning of June 2015. The Scots are definitely not Englishmen. The one who calls a Scot an Englishman will quickly attract a bad reputation in the country of whisky. In the referendum of 2014, a slim majority of the Scots may have decided against the independence from Great Britain but the mood shifted once more only a few days after the elections as rumours of election fraud started spreading and the British Prime Minister Cameron broke his promise to the Scots on several levels. The referendum was essentially decided by the ageing Scottish population, while the great majority of the youth (people up to the age of 50) asked for independence from Westminster. The predictions were unclear for a long time until Cameron let himself get carried away and make concessions and promises in case that Scotland would remain part of Great Britain. In the end, none of these were realised and the Scots felt massively deceived. As a consequence, the election result of Cameron's Conservative Party in Scotland at the general elections in 2015 was devastating. And yet he was re-elected because the Scots are, considering the numbers, a minority in the British society. The fact that their independence from Westminster would still have had dramatic economic consequences for the cooperation between the two countries is something which Cameron intentionally calculated into the lies of his campaign. The future most likely holds another referendum, possibly with a different result. *Please note: Kurtz Investigations Essen is a German investigation company with no license in the UK. This page is mainly to be understood as an informational offer for clients living on the Continent who lack the language skills to read the German version of this page. We can offer affordable traveling expense flat-rates for areas abroad, and we work with various professional, licensed cooperation partners in Scotland. Our chief investigator Patrick Kurtz is strongly connected to Scotland having his second home on the Isle of Skye.